Place one of your red berries on the skewer. Add a blueberry or two. Add a marshmallow or piece of coconut. Repeat above steps until you only have an inch and a half or so left at the top of the skewer. Slice a thick slice of watermelon. 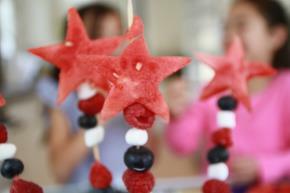 Use a cookie cutter shaped like a star to punch out a star in the watermelon slice. Place watermelon star at the top of the kabob. Cast a spell with your magic fruit wand before eating!